Mary has used McCall's 6444 to make another stunning little jacket, this time in the new ruffled knit! The simple styling really allows the fabric to speak, and with no closures, this wrap goes together in no time. The front lapel drape is flattering and playful and much less complicated than it looks. This great ruffled knit has is available in several colorways, each combing several shades in an organic variegated print, with ruffles on one side and smooth color on the other. Come in and check 'em out! We have a couple new patterns in at Treadle from independent pattern company Oliver + S, the Roller Skate Dress and the Pinwheel Tunic. Oliver + S makes patterns for children's clothes from size 6 months to kids' 12 in sweet, timeless designs with subtle modern details. Each pattern cover is charmingly illustrated with a paper doll and outfit. There are other sweet details as well, such as ranking the sewing difficulty in number of scissor symbols. More scissors = more challenging! The patterns come with clear, fully illustrated directions, making each one a pleasure to sew. Sew something sweet for the little ones in your life! Come check out these and the variety of other children's sewing patterns available at Treadle. We have a selection of new silk knits in the store. Soft, drapey, with a slightly rough texture, these fabrics are like the equivalent of silk noil, but with the comfy stretch of a knit. Silk takes dye brilliantly, so the colors are deep and saturated. These fabrics would work up beautifully in a dress or skirt with simple styling, or would make a comfy, slightly heavier weight top or tee for the transition to warmer weather. Check out this great new group of cotton prints with retro-mod styling. Records, cassette tapes, console TVs, and vintage eyeglasses cover the solid backgrounds in geometric layouts. The line is Geeky Chic from the much-admired Riley Blake designs. This mid-weight cotton is ideal for simple garments with quirky style. Try an A-line dress or a boxy bowling shirt. Or use it for a nifty handbag or case for your phone or tablet. Another gem from Rebecca! This black cotton eyelet dress currently on display at Treadle is just the thing for spring! We all admired Rebecca's clever use of the eyelet fabric's decorative scalloped selvage as trim. She simply trimmed off the selvage, then applied it as you would any flat ribbon or lace; she used this treatment on both hem and armholes. The neckline is finished with black petersham ribbon with neatly mitered corners. Rebecca used McCall's pattern 6554 for this dress. Both the pattern and fabric are currently available at Treadle! The shot cottons have been popular at Treadle for quite a while. Now we have several striped pieces to add to the solid mix. Rich, multi-hued tones in woven stripes will blend perfectly with a solid shot cotton, or be bold and combine these with a print. 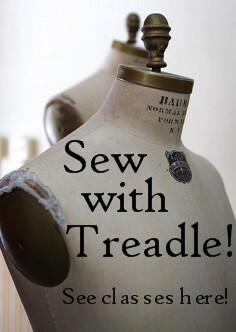 Treadle has been revamped for Spring! Wools have been moved back to make way for all the luscious new printed cotton, rayon, linen, and more. Yeah, I know I was just telling you all that it's still flannel jammie season, but as sewists, it's good to look ahead, right? Besides, it'll be hard to resist some of the exciting new offerings. Like more lightweight cotton prints in easy-to-wear small scale florals. And here's a taste of some great new prints from Art Gallery fabrics. I know we've been talking spring for a while here at the Treadle blog, but let's face it, this is Minnesota; it's still flannel pajama season. And we've added some charming new kids' prints to our flannel selection. Whether you need soft baby pastels or whimsical brights for older kids, we've got you covered. I love these crazy bright ones with the monster dollies. I love this small group of fabrics from Moda. From Moda's Indigo Crossing line, we have two striped fabrics and two with an ikat weave, a process in which the warp is threaded onto a loom and printed with a design before the weft is woven in, producing soft, somewhat blurred motifs with a unique look. Any of these soft cottons would make a comfy casual shirt or dress.